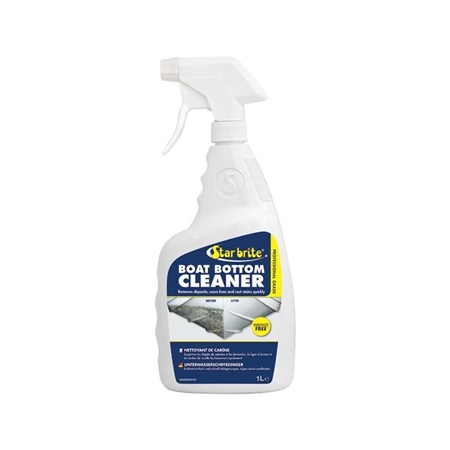 -Removes deposits on boat bottoms, scum line and rust stains quickly and easily. -Water based, environmentally friendly, biodegradable formula. -Special patented buffering process makes this product safer than other acid based bottom cleaners. Remove boat from water. Allow deposits and stains to dry thoroughly. Stains and deposits found above the water line may be removed while boat is in water. Apply product to the dry surface of hull using an all-plastic sprayer, non-nylon roller or brush. Keep deposits and stains wet and foaming with the product. Foaming indicates the product is removing the deposits. Reapply as needed to maintain foaming action. After 10 minutes of foaming action, most surfaces should be clean and ready for rinsing with water. Heavy deposits may require several applications and light scraping. If sprayer is used, pump fresh water through before storing.